Well the move is complete. The move is. Unpacking and getting settled will take weeks yet. I loathe moving. There is always the unexpected this or that to deal with as well as all the stuff you know you’re gonna’ have to do. I was thinking about chronicling the experience but I’m pretty sure nobody really cares. I will say that the new rental is a dump not as nice as the old place and so far it has been one headache after another. I have tons of examples but they all pale in comparison to a cockroach infestation that I can only describe as Biblical in proportion. Last night I got up for some water and spotted a big guy near the sink. I’m telling you this was the Yao Ming of cockroaches people. He looked at me dead on, antennae whirling, as if to say, “What? You want some of this?” I swear he smirked before making a move for the drain. The plastic cup I hurled clanged all around the sink but somehow missed the mark. My time will come. I now know everything there is to know about the various Chinese methods of killing cockroaches. I’ve actually been quite successful but the buggers just keep coming. I’m living in a complex that isn’t very old but apparently the apartment itself was all but abandoned for two years and I am on the ground floor. Still 17 months before the new place is complete. I took a walk around the new neighborhood a couple of nights ago. The complex I’m living in is directly across the street from the new Liuzhou People’s Hospital. The hospital has been open less than two years. As is the norm with seemingly every building of note here, it’s lit up like something out of Close Encounters. My new neighbors include some of the city elite. 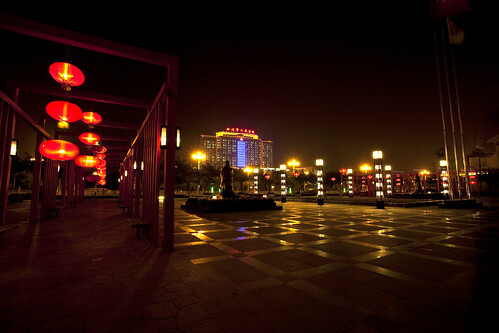 The Hedong area includes the new city government building and scores of ultra-modern hi-rise apartment and office buildings. 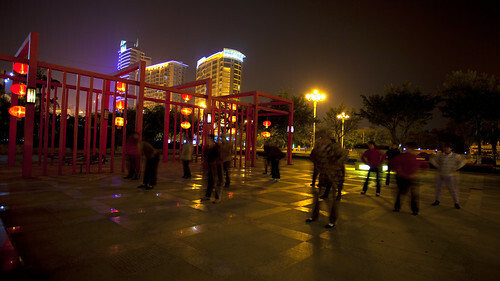 Below, some old gals get in their evening exercise in the complex square. 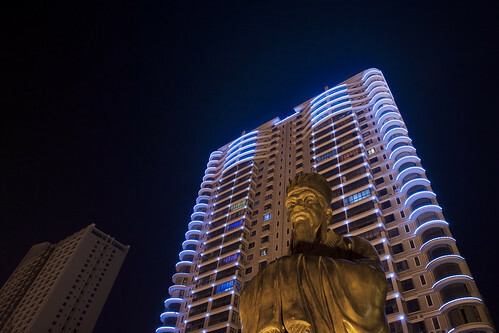 Confucius takes his place among the hi-rises, providing a juxtaposition of traditional China and the new China that’s charging ahead at break-neck speed. The new semester begins next Tuesday so I may not be around as much as I have been, at least not until I get somewhat settled into my routine. I’ll try and make the rounds soon. Hasta! ~ by Expatriate Games on March 7, 2010. Cockroaches………ewwwwwwwwwwwwww. Unfortunately can be part of Asia more often than not. I put bleach down all of my drains on a regular basis. Seems to work for me. I’m new to the town. Where is the East Side? Try to learn this city through your lenses. Hi Mo Yu, well, the East Side is on…. the east side! 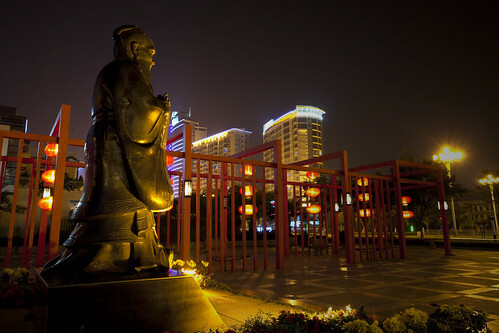 If you know where the new People’s Hospital is, or the new Liuzhou Government building is, or where GXUT is, then that’s the east side, on the east side of the Liujiang! Thanks for visiting the blog, look forward to meeting you someday.